“We choose to go to the moon. We choose to go to the moon in this decade and do the other things, not because they are easy, but because they are hard, because that goal will serve to organize and measure the best of our energies and skills, because that challenge is one that we are willing to accept, one we are unwilling to postpone, and one which we intend to win, and the others, too." - John F Kennedy, September 12, 1962 Astronaut and artist Alan Bean is not only the first artist to paint a world other than our Earth who actually went there, he is the first in history to paint our Earth after viewing it from space. His art’s significance as the original human interpretative record of man’s first off-world experience will only increase in its importance and value over time. Those of us who were lucky enough to be alive during the Apollo program look at Bean’s art and share the stirring of emotion, pride and the sense of awe that we experienced as we lived through the fulfillment of President Kennedy’s challenge. The whole world (the artist’s “fellow earthlings”) can now look up at the moon in the night’s sky and know that human beings were once there looking back at us. 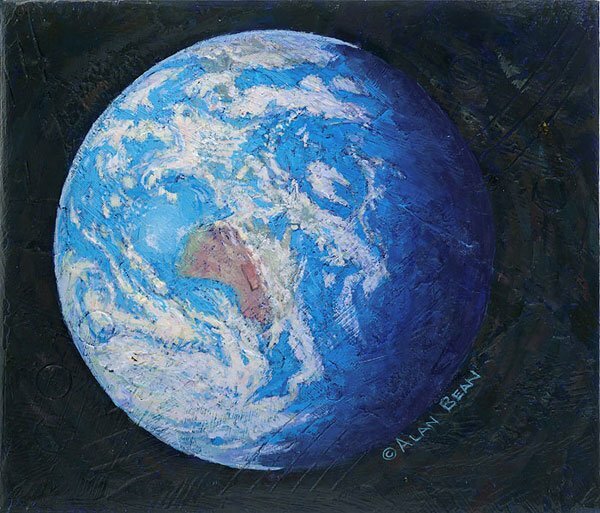 “Over the years I changed my profession from NASA astronaut to space artist,” says Alan Bean. “I have created several paintings of earth and in the years since the Apollo 12 mission, my astronaut eyes have gradually been replaced with artist eyes. I now see the Earth in my mind’s eye as much brighter than recorded by our cameras,” he says about "A Jewel in the Heavens," “and I paint the Earth in bolder colors now.” This Fine Art Giclee Canvas not only takes us off this Earth to look back upon it in the company of an Apollo astronaut, it is a ticket back to one of the most fulfilling times in our lives.